It has been raining and unseasonably warm this week. I have been assured that winter will resume. No need for panic, there will be plenty of time for sledding and skating... just not right this minute. My snow boots aren't going back into the closet just yet. 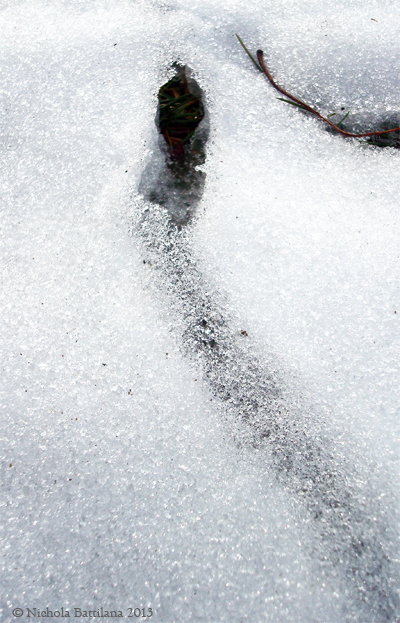 This morning I discovered something interesting in the melting snow. A rather long trail. 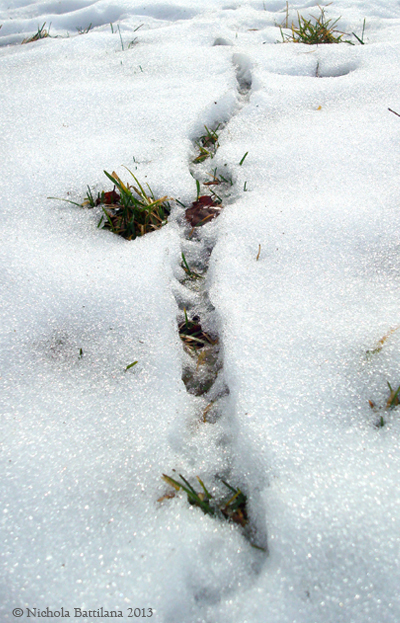 For more than fifteen feet this line appears in the snow. There are spots where the snow has not completely melted but you can make out the dark line of the tunnel beneath a thin layer of frosty ice. In other spots the snow has melted away and evidence of a small burrowing friend has been exposed. Perhaps he was on his way to a holiday party? I like the idea of a bustling world beneath that white surface. Perhaps if I followed the trail I'd find a stash of stolen sunflower seeds from the bird feeder and the button that popped off my coat last Thursday. What a lovely little trail! Perhaps a few fairies had a hidden little path, and they might have your button as well, was their any faerie dust left behind?